Join Chabad East Lakeview Ckids Club for a fun evening before Pesach! 1) Experience first hand how Shmurah Matzah is made - literally from "scratch". Starting with grinding the wheat, mixing the flour and water, rolling out the dough, poking holes, and finally baking and eating our own Matzah's! The Model Matzah Bakery is guaranteed to generate excitement for Passover and a renewed appreciation of Matzah Shmurah! 2) Your time machine awaits. 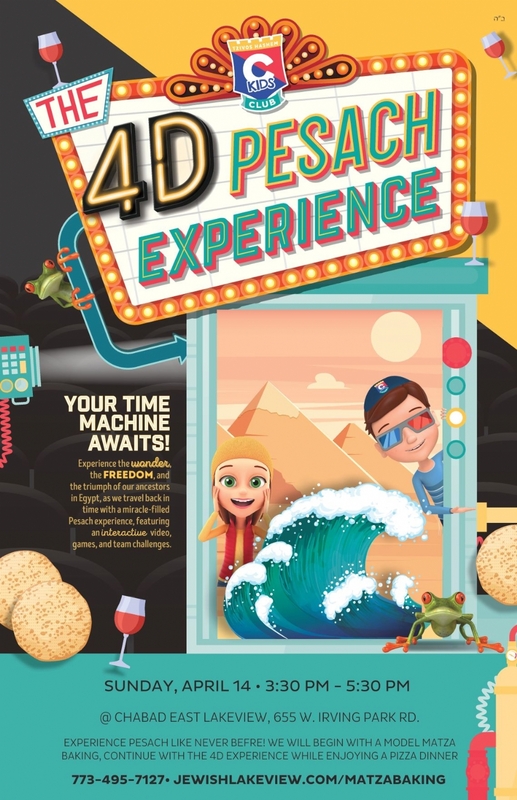 Experience the wonder, the freedom, and the triumph of our ancestors in Egypt, as we travel back in time with a miracle-filled Pesach experience, featuring an interactive 3D style video, games, and team-challenges. Children will enter the 4D Pesach Experience to learn about the story of Pesach. The program will include a 3D style movie and interactive activities that will make the story of Pesach come alive!